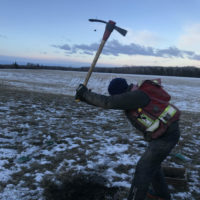 What do archaeologists do in the winter, aka what about the snow and frozen ground? – Circle CRM Group Inc. In an ideal world, archaeologists would be digging up fabulous things year-round, following the sunshine and warm weather. Ahhhh… sadly, that just isn’t the case, especially if you live and work in Canada. 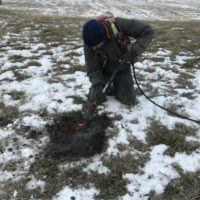 In general, our winters are spent cataloguing artifacts recovered over the field season, and writing reports about all the projects completed over said field season. This is absolutely fine with us; if we’re lucky, we can even get on a plane and take a vacation! 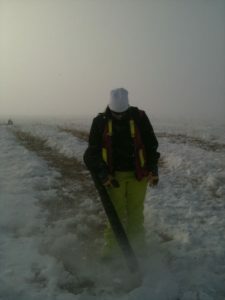 Every now and again though, we are asked to do fieldwork in the winter. Ack! Winter work?! But how? 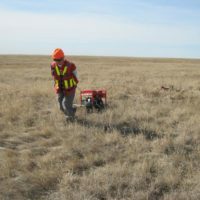 Fieldwork is normally conducted under snow-free and frost-free conditions. So, we need to get rid of the snow and frost. 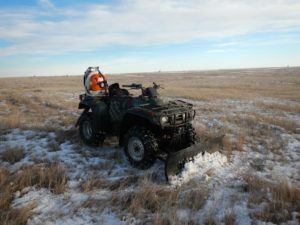 On the plains, we can use snow blowers (or this wonderful ATV-plow, but used carefully). This often works quite well, but we need to ensure clearance is sufficient to convince us that we haven’t missed any surface features. In the forest, snow cover is less of a concern for surface features, but heavy snow can detract from the analysis of microtopography. 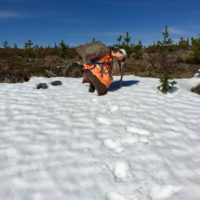 Option #1 is always to wait until spring, but if that option isn’t available, we need to plan well in advance: have the right gear (snowshoes, winter clothing) and the right transportation (watch this video on the big debate: Argo vs Sled). Concrete saw! I have actually not yet utilized this option, but it is a popular one in NE BC. 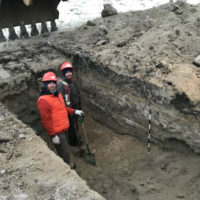 Seems like a good option, as it involves taking that block of dirt home, thawing it, and screening through the sediments. Probably the highest chance for artifact recovery (but maybe the highest chance of getting kicked out of your hotel room for the mess you made). Electric jackhammer. This was my go-to when I worked a lot on the plains. 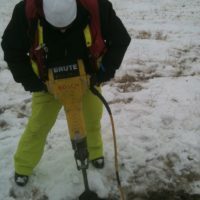 It involves lugging around a generator (plastic sled works great) and then digging holes with a jackhammer. In my younger days, this was a 60-lb machine, but then I downgraded to the 24 or 34-lb option. Critics would say you can create your own flakes this way, but I’d like to think we’re good enough to tell the difference between a prehistoric lithic and a freshly broken rock. Tiger torch. Holy moly, this is like watching paint dry. I wouldn’t actually recommend it, unless you enjoy that sort of thing. You literally have to thaw the sediments, in order to remove and screen them. Fieldwork during the winter is pretty tough. The crew is cold, and the work is much more physically demanding than we are used to. Teamwork is key! As is proper planning. Seriously. Don’t forget your snowshoes!